Excellent for lubricating and protecting most equipment. Use Magnum 44 before assembling equipment to speed up work and prevent future corrosion. For use in Automatic Vending Machines, Lumber & Other Building Material Dealers, Repair Services, Hotels & Motels, Metal Fabricators, Sports & Recreation, Industrial Machinery Manufactures and Office Machines. Contains Vydax. 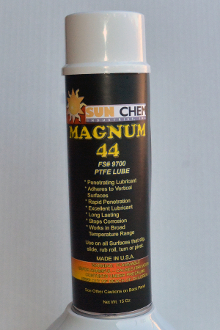 Magnum 44 is an aerosol penetrating lubricant fortified with friction-reducing substances, and a fluorotelomer dispersion. Penetrates rapidly to loosen parts that are frozen due to wear, corrosion, and heavy grease or grime build-up. Provides excellent and long-lasting lubrication to moving parts. Micron-size particles work like thousands of tiny ball bearings to dramatically reduce friction and wear. Zep 45 deposits a protective film to retard corrosion, prolong the life of machinery, and reduce down-time. The solvent action of Magnum 44 removes accumulations of grease and grime from surfaces to allow contact with the lubricating, protective film. The lubricating film remains effective over a wide temperature range (-55F to 475F.). Magnum 44 is excellent for use on industrial machines, business machines, motor shafts, guns, sports equipment, shop tools, saws and drills, electric motors, vending machines, locks, hinges, rollers bearings, conveyors, pulleys, nuts and bolts, all rusted and corroded parts. Use on any surface that slips, slides, rubs, rolls, moves, turns, twists, or pivots.